Silent Spring. Boston: Houghton Mifflin Company, 1962. "What has already silenced the voices of spring in countless towns in America?" 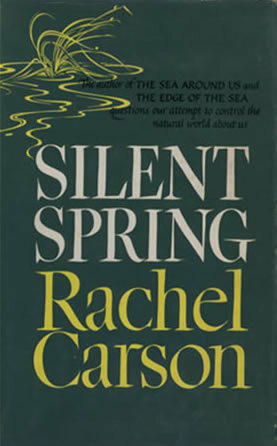 Rachel Carson, a biologist and writer, wrote Silent Spring to document the toxic effects of DDT and other pesticides on birds and different parts of the Earth's ecosystem. First serialized in The New Yorker, Carson and Silent Spring were attacked by the pesticide industry, who attempted to discredit her work. Carson's work withstood the attack, as John F. Kennedy's Science Advisory Committee upheld her findings. Further investigations into DDT led to its ban in 1972. Widely read, Silent Spring helped spur the development of the environmental movement in the 1960s, as people increasingly began to realize the impact humanity had on the environment.